Our Prime location in the Center of Main Street Hyannis is the perfect setting for a memorable Cape Cod Vacation, which features a variety of guest rooms to accommodate couples & families. This fine family run Hotel is a great choice for active vacationers who want easy access to do and see everything the Cape has to offer. So once you arrive you may park your car and walk to: Quaint shops, boutiques, Art galleries, Restaurants, Harbor & Island Ferries to Nantucket & Martha’s Vineyard, JFK Museum, Melody Tent and the Hyannis Youth Community Center. 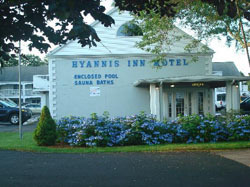 The Hyannis Inn offers a relaxed, friendly atmosphere and gracious hospitality, which is why “our” guests return time & time again..You’ll understand why after you’ve experienced for yourself the excellent facilities…. and after a day of shopping & sightseeing, relax in our Elbowroom Lounge or take a few laps in our Large heated Indoor Pool or tan yourself on the sundecks! The choice is yours…. We look forward to accommodating you & assisting you with insider tips as to: where to dine, what beach to go to, traveling tips & how to enjoy Cape Cod as much as we do!